You are currently browsing articles tagged Harissa. A very tired Virgin in Lebanon. Photo by David Lansing. The Pope is quitting. He’s had enough. Enough what? I don’t know. Maybe he’s tired of having to wear all those funny hats. If he were a dog, they’d put him down. Instead, they’re sending him off to an empty nunnery. They say one of the reasons he’s quitting is because he just can’t travel anymore. It’s too damn hard on him. One of the last international trips he made was a three-day visit to Beirut back in September. I can’t imagine what the security must have been like for the Pope. Can you imagine if he was assassinated in Beirut? Jesus Christ. All hell would have broken out. 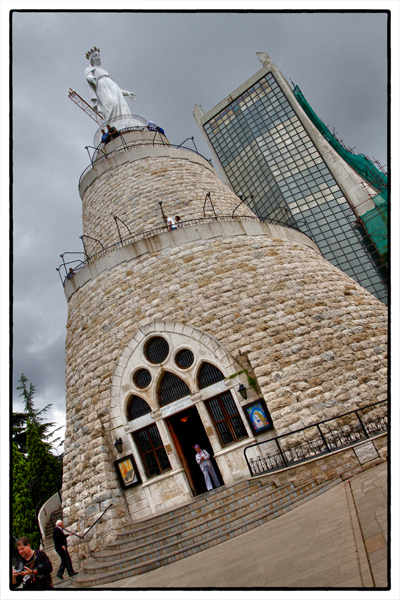 While he was here, he made a visit to the pilgrimage site of Our Lady of Lebanon, the patron saint of Lebanese Christians (who make up about one-third of the population) in the little village of Harissa. So I went to visit Our Lady of Lebanon this weekend. She looks like she’s perched atop an odd stone lighthouse. Or maybe a bee hive. If you want to get close to Our Lady, you have to stand in line and wait your turn to climb the hundred-plus steps up the circling staircase. Sort of like climbing the stairs to get to the Blarney Stone in Ireland. And when you finally make it to the top, what do you do? You take a photo. And take a look at the Virgin, who has been standing here like this for over one hundred years. She looked tired, Our Lady. And a little bit sad. Sort of like the Pope. And if she could, I’ll bet Our Lady would quit her job standing on top of this hill in Harissa and move to an empty nunnery. Where she would probably put her tired feet up on the coffee table and eat bowls of chocolate ice cream while watching Honey Boo Boo on TV. Why not? When you get to be this old, you can do whatever the hell you want.